Didier Drogba has been granted permission by world governing body Fifa to play in the World Cup while wearing a cast to protect his fractured arm. The Chelsea forward's involvement had been in doubt after suffering the injury in a friendly against Japan on 4 June, but his recovery has gone well. Fifa said that Tuesday's referee Jorge Larrionda had permitted the cast. 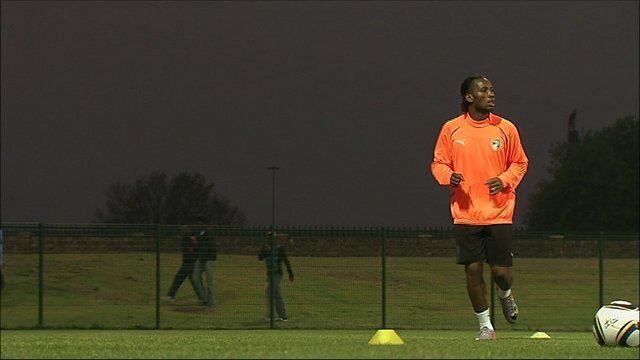 Drogba, 32, came on as a 65th-minute substitute in Ivory Coast's first group G match against Portugal on Tuesday. Fifa's head of media Nicolas Maingot said: "The cast has been seen by the Portuguese delegation at Monday's match co-ordination meeting." Accordingly, all parties were satisfied that the cast did not pose a danger to other players - although the Ivory Coast coach Sven-Goran Eriksson decided not to risk him from the start at Nelson Mandela Bay Stadium. "Everybody knows what Drogba is for Chelsea and for us - he's a great player," said Eriksson ahead of the match. He added: "[But] we have a lot of good players who are strong and have good technique. "We're in a difficult group with Portugal, Brazil and North Korea, but the boys are working very hard." Drogba required surgery after fracturing his arm in Sion, Switzerland, in a collision with Japan defender Marcus Tulio Tanaka - three minutes after the forward had opened the scoring with a 13th-minute deflected free-kick. Afterwards, Eriksson refused to blame Tanaka for the incident. "It was unlucky," the 62-year-old former England boss said at the time. "It wasn't bad or stupid. He didn't want to hurt anyone. Football is a game of contact." At the 1970 World Cup, Germany defender Franz Beckenbauer wore a sling in the semi-final against Italy having dislocated his shoulder during the match, while England striker Gary Lineker sported a cast to protect a broken wrist during the 1986 competition.